Electricity bills don't have to be an inevitable cost of doing business. Energy costs increase practically every year, and this can negatively impact even the most well-planned budgets. Companies don't have to function with this uncertainty or these ever-accumulating cost hanging over their heads. Generating your electricity can help minimize your operating expenses while mitigating the long-term risk associated with energy pricing. In this case study, we’ll look at how installing a solar electric system can help you lock in predictable and affordable energy rates for your business. Think of it like bulk purchasing. 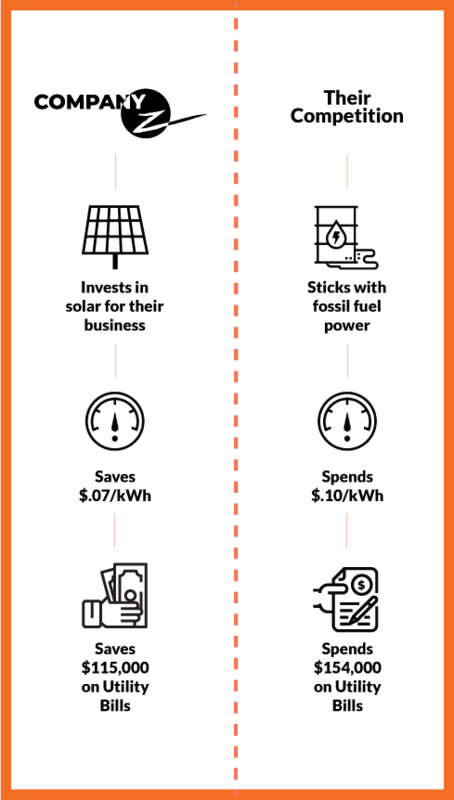 Buying a solar system for your business is like buying your electricity up front. You can lock in your rate by paying a fixed cost for the system that produces your energy. ​If you were to look at your electricity bill, you’d see that the units of energy you purchase are called a kilowatt hours (kWh) and kilowatts (kW). Charges for those units are broken out into multiple categories like delivery, supply, demand, and meter fees. Solar can offset them all, ultimately zeroing out your electricity bill. Let’s say Company Z’s total electricity bill (all charges included) was $400 for the month, and in that month they bought 4,000 kWh. That would make the cost for that electricity $0.10 per kilowatt-hour (kWh). As fossil fuel costs increase and utility providers continue to receive rate hike approvals from the Public Service Commission, that price per unit will likely only increase over time. With minimal rates increases (2% or less), within the next ten years that $400 a month could realistically become $480 a month. Even with such a small escalation, company Z could realistically be paying as much as $52,560 for electricity over the next ten years. Instead of spending the utility company an ever-accumulating share of your companies profit, you can invest in a solar system that locks in your rates and enables your business to increase its bottom line year after year. Unlike other types of equipment investments, Solar systems tend to be maintenance free and have an extended (25-year) power production guarantee. As an added benefit, you can still depreciate a solar system just like any other equipment investment. ​"The combination of bonus depreciation, State energy grants, and Federal tax credits typically reduce the overall cost of a commercial solar system by as much as 70%." Depreciation - Due to recent tax reform, solar customers can depreciate 100% of the allowable capital costs in Year 1 rather than over five years. This tool dramatically improves Year 1 economics, often accounting for as much as 30% of the project cost. Federal Tax Credit - The Federal Investment Tax Credit is the most impactful tool for making commercial solar financially attractive. 30% of the total project cost can be taken as a dollar for dollar tax credit flexibly according to you tax appetite. 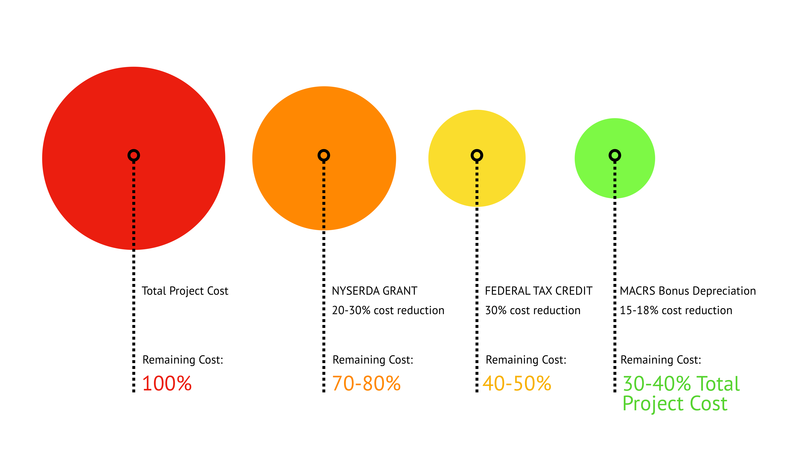 NYSERDA Grant - NYSERDA, a NY based organization that runs and operates the NY-SUN initiative, offers grants based on the size of the system installed. These grants can typically reduce the up-front costs of projects by 20% or more. The combination of bonus depreciation, State energy grants, and Federal tax credits typically reduce the overall cost of a commercial solar system by as much as 70%. ​When you divide the final purchase price of a solar system by the number of kWh generated by that system over its life, you’ll see often see a levelized cost per kWh of around $0.03. That’s a savings of $0.07 per unit, and when you’re talking about hundreds of thousands—sometimes millions of units—that savings adds up quickly. Company Z has now saved a massive amount of money compared to its’ competitors. While its chief competition has spent more than $154,000 on energy costs over a solar system’s life, Company Z has saved $115,000 and invested those funds into growing their business. Using tools like NYSERDA Grants, Federal, and Local tax incentives, and accelerated depreciation options a company can expect to pay off their system in as little as six to nine years. ​All in all, commercial solar has become an incredibly compelling option for businesses of all sizes. What used to be the territory of large, manufacturing or production facilities is now feasible for companies of all types. ​There's never been a better time. Panel prices are at all time lows, and incentive packages are at all time highs. What does that mean for your business? Saving thousands on energy bills. Learn more by clicking the button below!